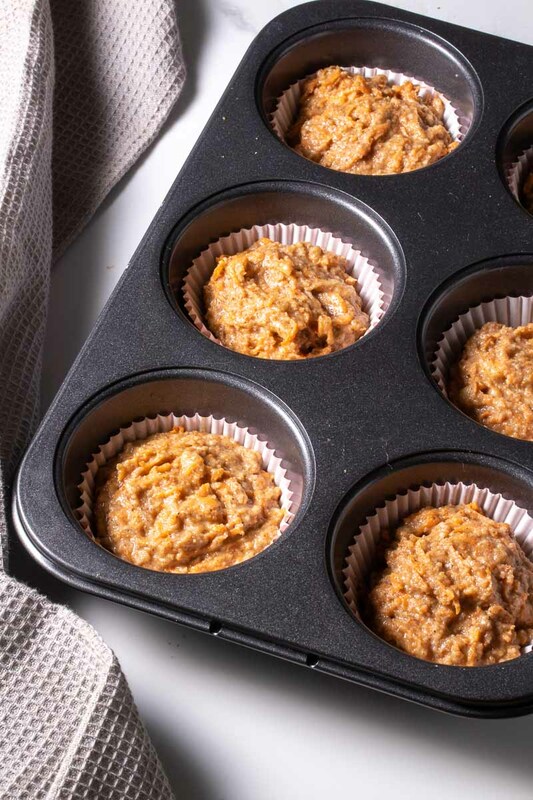 These healthy carrot cake muffins are low-carb, vegan-friendly, and super easy to make. They use one bowl, take only a few minutes to prepare, and always come out fluffy and delicious! Muffins are perfect for a quick morning bite because they’re quick to make and can be stored easily. How to make low-carb carrot cake muffins? 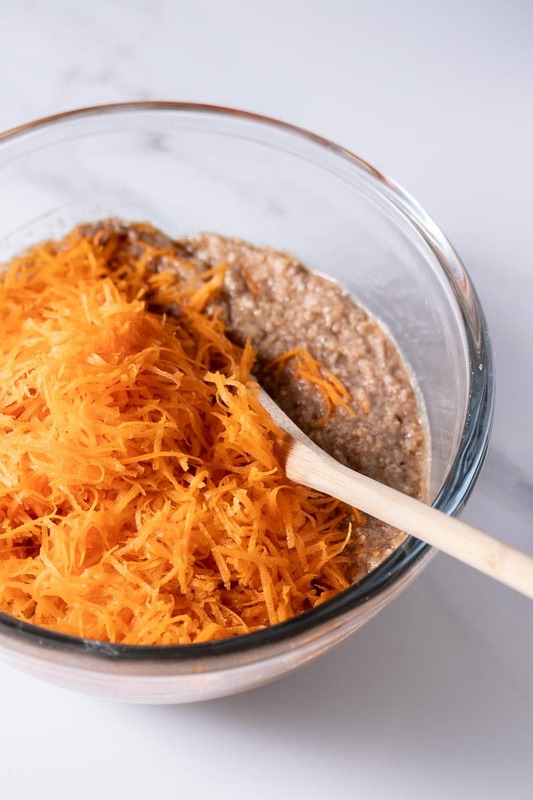 Making these healthy carrot cake muffins is a breeze! It all comes together in one bowl and prep time is only 5 minutes. Step 1: Add all of the dry ingredients into a bowl and whisk together thoroughly. Make sure to whisk out all the lumps and that the spices are spread evenly. You could also use a sifter to sift the ingredients together. 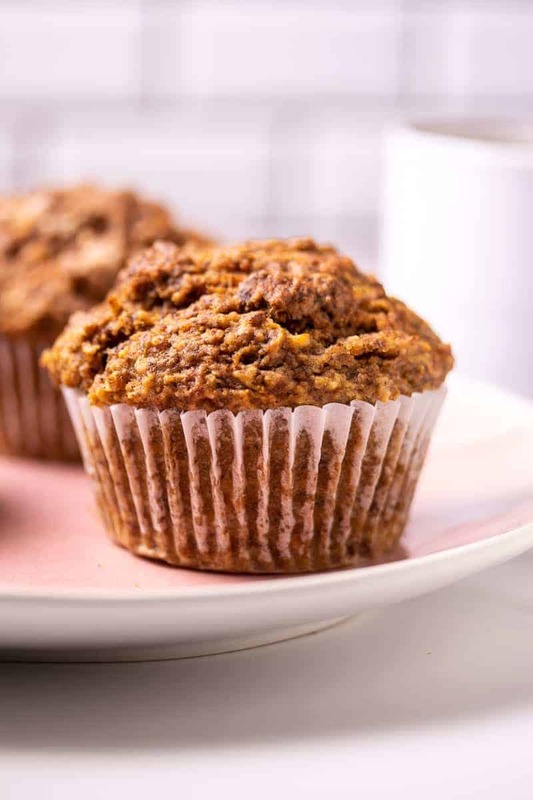 Tip: Use the freshest spices you can to give these carrot cake muffins a real kick! Since most of the flavor of these muffins comes from the spices, the better the spices taste, the better the muffins will turn out. Step 2: Mix the flax seed with 1/2 cup water to form a “flax egg”. Let it rest for 5 minutes. Step 3: Make a “well” (a small hollow) in the center of the dry ingredients and add in the coconut oil, flax egg, and vanilla extract. Mix together until a rough dough starts to form. Then stir in the mashed bananas and shredded carrots. Tip: Fold the wet ingredients into the dry ingredients gently and be careful not to mix too much! The ingredients should be mixed until they’re just fully incorporated and not a minute more. This will keep the muffins fluffy and moist. Step 4: Spoon the mixture into muffin paper cups until just at the top of the paper. Place the muffin paper cups in a muffin tray. Step 5: Bake the muffins in a preheated oven at 350° F (180° C) for 35 – 40 minutes until baked through. Cool and serve! Make sure all the ingredients are at room temperature before mixing them together, anything that is too cold from the refrigerator could interfere with the baking process and the muffins could collapse in the oven. When making the batter, fold all of the ingredients together gently and don’t over mix. Over-mixing the batter will make the muffins more compact and stiff. When you spoon the batter into the muffin tray, it should be stiff enough to hold its shape. If it seems too runny, you can add a bit of almond flour and mix in until the right consistency is achieved. Depending on your oven, the muffins should be done after 35 – 40 minutes. You will know they’re done once the tops have browned and a skewer inserted into the middle of the muffins comes out clean. If you do not have gluten-free baking powder, normal baking powder will work just fine. 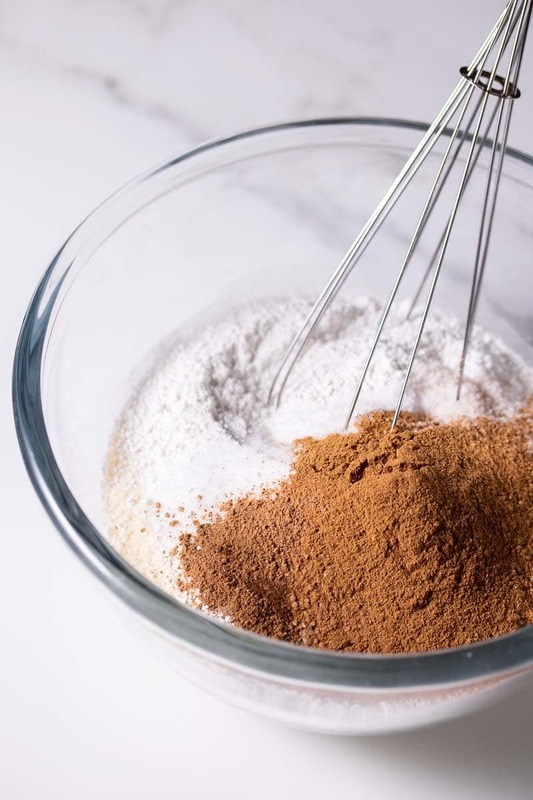 If you would like to keep the recipe gluten-free without the use of gluten-free baking powder, you can use another teaspoon of baking soda. The muffins won’t rise as much, but if you fill the muffin papers a bit more than 3/4 of the way they will come out perfectly muffin shaped. You can freeze the muffins once they have been baked in a freezer-safe container and they will keep well for a few weeks. 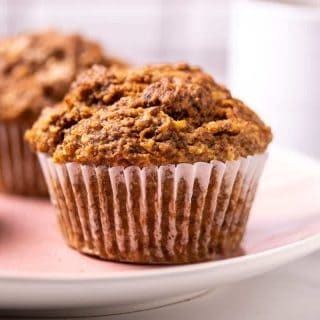 If you would like to bake the muffins fresh on the day you want to eat them but avoid all the hassle of making a batter, you can freeze the batter (without the mashed banana and shredded carrot). Then on the day, you just add the bananas and carrots to the thawed batter, bake and enjoy! 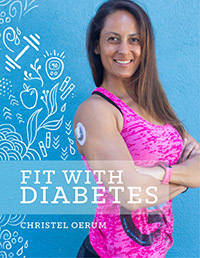 It’s no secret that I like my sweet (but healthy!) recipes. I love sweet breakfasts, sweet snacks, sweet desserts, and even sweet dinners sometimes. 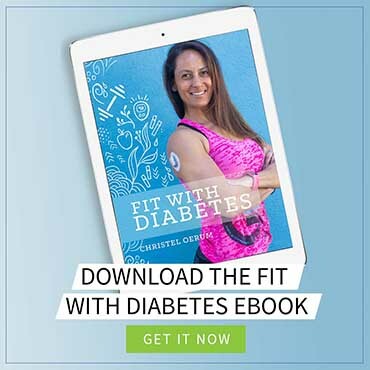 You can also read this roundup I created of low-carb breakfast ideas for diabetics for even more great recipe ideas. 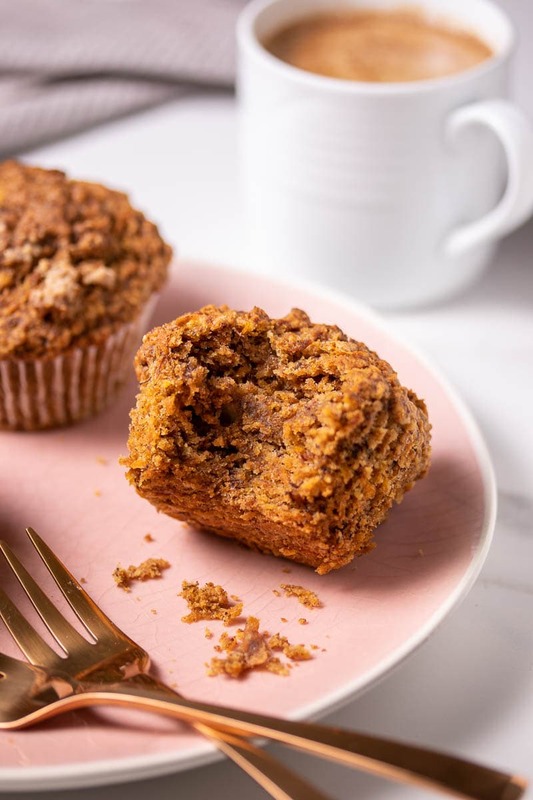 When you’ve tried these Vegan Carrot Cake Muffins, please don’t forget to let me know how you liked them and rate the recipe in the comments below! 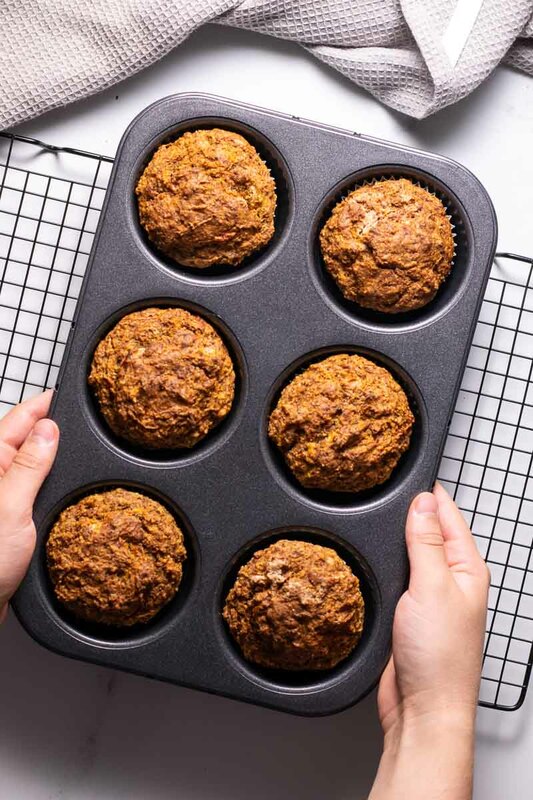 Making these healthy carrot cake muffins is a breeze! They come together in one bowl and prep time is only 5 minutes. Preheat your oven to 350 F (180°C), add muffin paper cups to a muffin tray and set aside. Add all of the dry ingredients into a bowl and whisk together thoroughly. Make sure to whisk out all the lumps and that the spices are spread evenly. You could also use a sifter to sift the ingredients together. Mix the flax meal with the 1/2 cup of water until it becomes a "flax egg". Allow it to sit for 5 minutes. Make a well in the center of the dry ingredients and add in the coconut oil, flax egg, and vanilla extract. Mix together until a rough dough starts to form. Then stir in the mashed bananas and shredded carrots. Spoon the mixture into muffin paper cups. Bake for 35 - 40 minutes until baked through. Allow to cool in the tray for 10 minutes and then remove the muffins from the tray. Then let them cool to room temperature and serve.